Editor's Note: Health care reform remained the topic of focus for Friday’s American Morning audience. Senator Baucus’ health care proposal, unveiled earlier this week, was criticized for claiming to be “bi-partisan” when neither Republicans nor Democrats had supported the plan. Many remarked that Senator Baucus had lost all “credibility” because of his push for inappropriate homeland security funding for his state. Dan: Why do you keep referring to the Baucus bill as bi-partisan? NOT ONE Republican supports it. Hopefully, no Democrats will support it either, since it is nothing but a giveaway to the insurance industry. I guess it's too much to expect that you corporate tools at CNN would want to explain these facts to your viewers. Jerry: Sen. Baucus lost all creditability when he supported giving 15 million to built/upgrade border crossing stations in his home state. A public option is the only way the American people will come out ahead in the health care bill, anything else we lose. Armando: Horrified by the "Wingnuts" of the week segment. I work across the street from you folks here in DC. There is literally a mob mentality in the right wing right now....open racism towards our President and you folks try to make it funny? And act like there is an equal amount of lunacy on the right and left? Come on. This type of belittling of racism and extremism will lead toward violence toward our President and the left. Pelosi's speech the other day should set off alarm bells...The real nuts out there with guns here the Republicans yell at the President, talk about going toward Socialism…there are many who would commit violent acts to stop that. Wake up CNN and stand for something!. Stand for a civil discourse, and not yield to the mob. You can start by giving Lou Dobbs a pink slip. This Mexican American will never watch CNN when that nut is on. Joe: Just when I'm starting to think that CNN is reporting more factually and less right-leaning (which you began during the Bush W reign), you do it again. The Wingnut segment was totally right leaning. There is NO excuse for Joe Wilson lashing out at the President, I don't care which party you are, but all you said was that he collected a ton of money over it and became a hero, etc., with no mention even of his opponent raising a ton of money, as well, or that MANY Americans are outraged over what Joe did. Then the host said several times that he attended the 9/12 rally and talked very positively about that along with your never ending clips of those Obama-bashing rallies attended only by the radical right, always showing that disturbing banner of Obama made up to look like the Joker. For years, I counted on CNN to simply give me the news in a factual, non-biased way and you need to get back to that. We Americans MUST, AT MINIMUM, give Obama and the Dems a FAIR SHAKE after 8 years of almost losing everything due to Bush & Cheney! President Obama has been in office for less than a year. Is he being judged too harshly by conservative critics? How do you feel about the strong opposition to many of his policies? Should he be given a “fair shake,” as the viewer above requests? From the WWE to the Senate? Could she be the next Jesse Ventura? Linda McMahon is stepping down as CEO of WWE to make a bid for the U.S. Senate in Connecticut. Linda McMahon is stepping down as CEO of World Wrestling Entertainment to enter the race for U.S. Senate in Connecticut as a Republican. She’s exchanging the wrestling ring for the political ring. And she has a tough fight ahead of her. McMahon discussed her Senate bid with Kiran Chetry on CNN’s “American Morning” Friday. Below is an edited transcript of the interview. Kiran Chetry: I just want to know, first of all, what made you decide I'm going to go for this year and I’m going to try to get through the primary and try to challenge Chris Dodd? Linda McMahon: You know, Kiran, I'm a businesswoman and I've been watching what's been going on. The mounting debt that we have, people out of work, reckless spending going on in Washington and I couldn't sit on the sidelines and watch anymore. I really wanted to get in, to do something. I've found also as I've traveled around Connecticut and talked to people, there's been a growing sentiment and really consistent that our citizens have lost faith and trust in Chris Dodd. It was a good time to get in. It seemed the right time to get in. So I want to get there and make a mark for the people of Connecticut. Introducing new concepts in the Army is never easy. The Army is deeply rooted in tradition and is typically resistant to change. While that mindset does have its benefits it can also hinder the military from moving forward. That has been the case for its physical training. For decades it has gone unchanged but now things are moving in another direction. When Jason Carroll and I arrived at Fort Campbell we were introduced to Eagle Tactical Athletic Program or ETAP for short. This new training program was born out of a realization by the Army that soldiers were suffering a 40 to 60 percent injury rate during training. They brought in Dr. Scott Lephart of the University of Pittsburgh's Department of Sports Medicine and Nutrition who has had success with reducing injury in professional sports teams. Lephart and his team spent 3 years compiling data on soldiers looking at what puts the most stress on soldiers physically and how to train them so their bodies can best withstand that stress. The result is the ETAP program. ETAP is a big step away from the traditional calisthenics that the Army has put its soldiers through. Through 45 second interval circuit training, it focuses on boosting a soldier's speed, agility, flexibility and balance. When we spoke to the soldiers going through this program their enthusiasm for it was clear. WASHINGTON (CNN) - The House of Representatives approved an amendment Thursday that calls for halting government funding to the community organizing group ACORN. The videos have sparked controversy over ACORN, already under fire amid election fraud claims. The measure, added to a larger bill on reforming student loans that won House approval, follows a provision passed earlier in the week by the Senate that would halt Housing and Urban Development grants to ACORN. Both measures would have to have their differences reconciled in Congress to take effect. ACORN's chief executive officer says that the group gets most of its money from members and other supporters and that its operations would continue even if it is cut off from government grants. However, approval of the House and Senate measures demonstrated the political fallout against ACORN after the recent release of videos that appeared to show the agency's employees condoning illegal actions. Editor’s note: John P. Avlon is the author of Independent Nation: How Centrists Can Change American Politics and writes a weekly column for The Daily Beast. Previously, he served as Chief Speechwriter for New York City Mayor Rudy Giuliani and was a columnist and associate editor for The New York Sun. 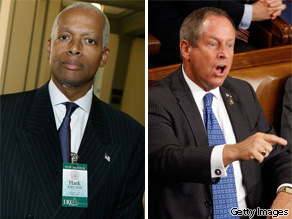 Rep. Hank Johnson (D-GA) and Rep. Joe Wilson (R-SC). Who knew that we could hit a new congressional low so quickly after the summer recess – or that the uncivil outburst would become a conservative rallying cry approaching absurd folk hero status? But that’s what happened to South Carolina Congressman Joe Wilson since he shouted “you lie!” at President Obama during a joint session of Congress last week. It was, by all internal accounts, an unhinged moment of anger. Wilson apologized to the president soon after and was roundly criticized by the likes of John McCain and other leading Republicans. He became the face of our coarsening civic dialogue, a sign that Tea Party anger is gaining currency in Congress. This week, the House decided to offer the first formal resolution rebuking a congressman for speaking out while the president was giving an address in its history. Wilson deserved it for his wing-nuttery, but my guess is that it will only make him more of a martyr to the fringe. No problem so far. But then Congressman Johnson brought the specter of the KKK into it. “I guess we'll probably have folks putting on white hoods and white uniforms again and riding through the countryside, intimidating people," he said. "That's the logical conclusion if this kind of attitude is not rebuked." On "Wingnuts of the Week," we’ve condemned overuse of KKK, communist and Nazi references in domestic political debates from whatever the source. Wilson and Johnson’s remarks are not equivalent, but saying that idiotic incivility will lead logically to a resurgence of the KKK doesn’t help the argument or the healing process. The moderate majority of Americans see Wilson’s comments for what they are – an unhinged ugliness bubbling up around this president. The wingnuts' increasing influence in American politics should be a wake-up call – it is a challenge to the idea that what unites us is greater than what divides us as Americans. Expect more turbulence this fall – and more reason for us to call out the extremes and keep them accountable. The opinions expressed in this commentary are solely those of John Avlon. Sources say the threat is very real and the FBI is saying nothing. Terrorists in the U.S. plotting an attack on New York City subways or commuter trains. Raids in Queens set off red flags. And the investigation has spread all the way to the Rockies. We'll tell you what our sources are saying. It was a tragic case: a team pushing themselves to the limit at football practice. It ended with a teen dead, three days later. The coach, who was charged with reckless homicide, has now been acquitted. We'll tell you what happened in court and talk with one of the prosecutors in the case. Millions were spent at border crossings in the middle of no where, but is anyone any safer because of it? The CNN Special Investigations Unit has some tough questions for the Department of Homeland Security and members of congress. It’s becoming one of the biggest awww moments of all time. By now you’ve probably seen the little girl throw her dad’s prized foul ball back at the Phillies game. How would you react? Well, he reacted with love. And the whole family is here live! Maid in DSK assault case speaks out: Will media interviews influence case?